for more Information or to make reservations. The Sands is a unique, custom-designed home . . .
. . . nestled in the firs and cedars just steps from the beach. The rooms are elegantly decorated, featuring the work of local artists. The living room and kitchen common areas open onto the beach. Each room has a private entrance from the outside and its own bathroom. 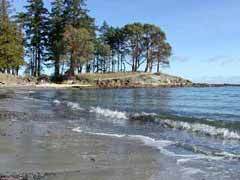 Morning Beach has Galiano Island's best sand beach and warmest bay. The beach is perfect for children and adults building sandcastles, exploring tidepools, or just sunbathing. The bay is protected by twin peninsulas which keep the water temperate and calm, which is ideal for swimming or boating.